TKD is one of the largest and best-known suppliers of cables and cable accessories with sales worldwide. The German company offers to its numerous clients a range of over 30,000 articles, providing a variety of applications for different sectors of industry. Within the group TKD, the company is able to develop know-how by 1400 professionals and moreover, TKD Kabel sales team consists of highly motivated, qualified and competent staff with many years of experience in the cable industry. In Germany, TKD owns two sites located in Iserlohn and Pliezhausen, aiming to offer to their customers a fast and reliable support, technical advice and other services to ensure the tranquility of its distributors and customers. The fully automated logistics base located in Nettetal offers a constant availability of most of the products and short delivery times. In addition, TDK meet the needs of all international customers by presenting the brand worldwide with subsidiaries and trading partners. 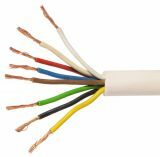 VIKIWAT Ltd. offers a variety of cables from TKD Kabel. In our store, you can find in stock quantities of LIYY flexible signal cables, LIYCY shielded cables and various other types of cables with affordable prices with quick delivery delivery. LIYY data cable 4x0.35mm2 Stranded LIYY data cable 4x0.35mm2. List Price 1.05лв. VAT Incl. 0.99лв. VAT Incl. 0.95лв. VAT Incl. 0.89лв. VAT Incl. LIYY data cable 4x0.5mm2 Stranded LIYY data cable 4x0.5mm2. List Price 1.40лв. VAT Incl. 1.32лв. VAT Incl. 1.26лв. VAT Incl. 1.18лв. VAT Incl. LIYY data cable 5x0.14mm2 Stranded LIYY data cable 5x0.14mm2. LIYY data cable 5x0.34mm2 Stranded LIYY data cable 5 x 0.34 mm2. List Price 1.40лв. VAT Incl. 1.33лв. VAT Incl. 1.26лв. VAT Incl. 1.19лв. VAT Incl. LIYY data cable 6x0.25mm2 Stranded LIYY data cable 6x0.25mm2. Colour code according to DIN VDE 47100. List Price 1.20лв. VAT Incl. 1.13лв. VAT Incl. 1.08лв. VAT Incl. 1.03лв. VAT Incl. List Price 2.90лв. VAT Incl. 2.75лв. VAT Incl. 2.61лв. VAT Incl. 2.46лв. VAT Incl. 2.32лв. VAT Incl. LIYY cable 7x0.34mm2 Flexible signal LIYY cable appl. DIN VDE 0814, IEC 812 with colour core insulation. List Price 1.60лв. VAT Incl. 1.51лв. VAT Incl. 1.44лв. VAT Incl. 1.35лв. VAT Incl. LIYY cable 10x0.25mm2 Flexible signal LIYY cable appl. DIN VDE 0814, IEC 812 with colour core insulation. LIYY cable 10x0.5mm2 Flexible signal LIYY cable appl. DIN VDE 0814, IEC 812 with colour core insulation. List Price 4.00лв. VAT Incl. 3.80лв. VAT Incl. 3.60лв. VAT Incl. LIYY cable 12x0.14mm2 Flexible signal LIYY cable appl. DIN VDE 0814, IEC 812 with colour core insulation. LIYY cable 14x0.14mm2 Flexible signal LIYY cable appl. DIN VDE 0814, IEC 812 with colour core insulation. LIYY cable 21x0.14mm2 Flexible signal LIYY cable appl. DIN VDE 0814, IEC 812 with colour core insulation.